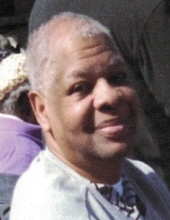 Jones, Cornelius “Pete”, 78, Ocala, Florida. Passed away January 5, 2019. Life Celebration for Mr. Jones will be held on Saturday, January 19, 2019, 11am at Sellers Funeral Home Chapel, 440 SW Broadway Street, Ocala, Florida 34475. Pastor Daryl Taylor will be conducting the words of comfort. Visitation will be at Sellers Funeral Home on Friday from 12pm to 6pm. Family and friends are asked to meet at Sellers Funeral Home at 10:30am on Saturday to form the funeral cortege. No viewing following the eulogy. To send flowers or a remembrance gift to the family of Cornelius Jones, please visit our Tribute Store. "Email Address" would like to share the life celebration of Cornelius Jones. Click on the "link" to go to share a favorite memory or leave a condolence message for the family.